Help Your Readers Get to Know You! My.EzineArticles.com amplifies your message: who you are, what you represent, and how you stand out from other authors. That’s where your Profile comes in. Your Profile is the #1 spot to talk about you, your company, your website or blog, and more. You are not required to fill in every blank; however, the more information you provide, the more you increase the odds of readers finding you, your website or blog, and your product or services. Increase your trust-factor by providing readers with more information about you and your credibility. Send MORE traffic back to your website or blog (up to 9 unique links)! Build your brand! 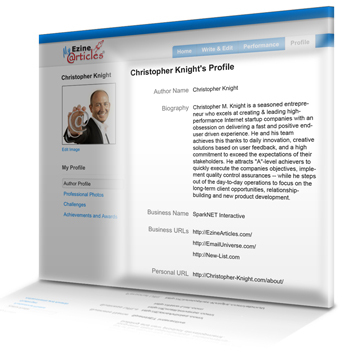 Remember, each of your articles leads back to your Profile. Expand your networking capabilities and social media presence. Leverage your expertise with the My.EzineArticles.com Recommendations. Adding, editing, and reviewing your Profile information is much easier with the new streamlined Profile on My.EzineArticles.com. First, log into your My.EzineArticles.com account. If you haven’t already, don’t forget to authorize your social networking sites in the Networking tab by selecting the corresponding social networking icon (Twitter, Facebook, LinkedIn, YouTube, and Google+). Next, select the Profile tab and ensure you have uploaded your Author Photo (learn how). 1. Write your Biography (in 400 words or less) to help readers get to know you. 2. Enter your Business Name. Up to 3 ISBNs or find a book or product on Amazon.com using our handy search feature. 4. Enter Keywords about you and your niche to help readers zero-in. Now go to your My.EzineArticles.com Profile and fill in as much as you can to get the maximum return on your investment of article-writing time and effort by optimizing your Expert Author Profile! Then, mark your calendar and come back to your Profile in a few months to make sure the information still applies or if you need to add/edit any links. This process takes a minimal amount of work and it will help maximize the traffic you receive. Thanks for pointing this out to me, I think that sometimes we get too busy doing other things, that we forget to do some of the more important things like updating your profile. Thanks for the info, we all need all the help we can get in getting traffic; making sure our individual profiles are optimized for maximum exposure is a win win. It worths the time optimizing the profile page. The more information we show, the more the visitors trust us and recognize our brand mark. I am working on it. Because have to get my blog up and running too. Hi Penny, just wanted to know how to prevent sharing repetitive info on the my.EzineArticles.com profile, since much of the content allowed via links on this interface has already been covered on the regular author bio page? I’ll jump in for Penny on this question. You’ll be happy to hear that the bio on the Members.EzineArticles interface is the same as the profile on My.EzineArticles – it’s just different terminology. In addition, the information you have in your bio on Members.EzineArticles will automatically transfer over to your My.EzineArticles profile and vice versa. Yeah, i am agree with the fact that well optimized profile increase trust and attract more traffic. Thanks for the info Penny. optimizing profile is a continuing task and not a one time topic. This article is helpful . As a new person, I would welcome anyone making specific change to improve their profile. I just linked twitter id and Google + as something new. Anyone else ? Thanks for your information, i from Indonesia so my speak english not good..
i like your articles …. Awesome.. I’m learning more from Ezne about writing, marketing and branding than I learned anywhere in school or life experiences. You are just great.